Hello! My name is Robin Raymer, the Plasterman. I love doing plaster repairs and enjoy training others how to do this type of work! My focus now is to share the knowledge I have of this great trade. I hope you enjoy exploring my site. I'd love to hear from you! You can contact me here. I repair and resurface plaster in the Peoria, Illinois area. Robin's work is a testimony to his expert plastering skill set. I have worked side by side with Robin on a extensive repair project with excellent results. - David Kelps, Multicraft Engineer, CHFM, Northwestern Medicine. LinkedIn review. My name is Robin Raymer. I was raised in the central part of the United States. Most of my life has been spent in Illinois. I've worked as a cashier at a grocery store, a janitor, carpet cleaner, and even delivered pies! I had a window washing business, did interior and exterior painting, and was a waiter in a French restaurant. I've done some cartooning, creating my own characters, Pete and Peaches, who currently appear in several greeting card lines. In 1980 I moved to New York City. In 1982 I was living in Brooklyn Heights, New York. That summer I was introduced to the plastering trade. All I can say is - Wow!! I knew from the very start that this was the trade for me. Especially when it came to plaster repair. It was interesting work, putting things back together, and required a lot of skill and artistic talent, which really appealed to me. Using materials from the earth to do the repairs made it that much better. And I found out that this was a great way to make money. What more could I ask for?! In 1984 I got married and moved back to Central Illinois. Shortly thereafter I started my own plaster repair business in the Peoria, Illinois area. 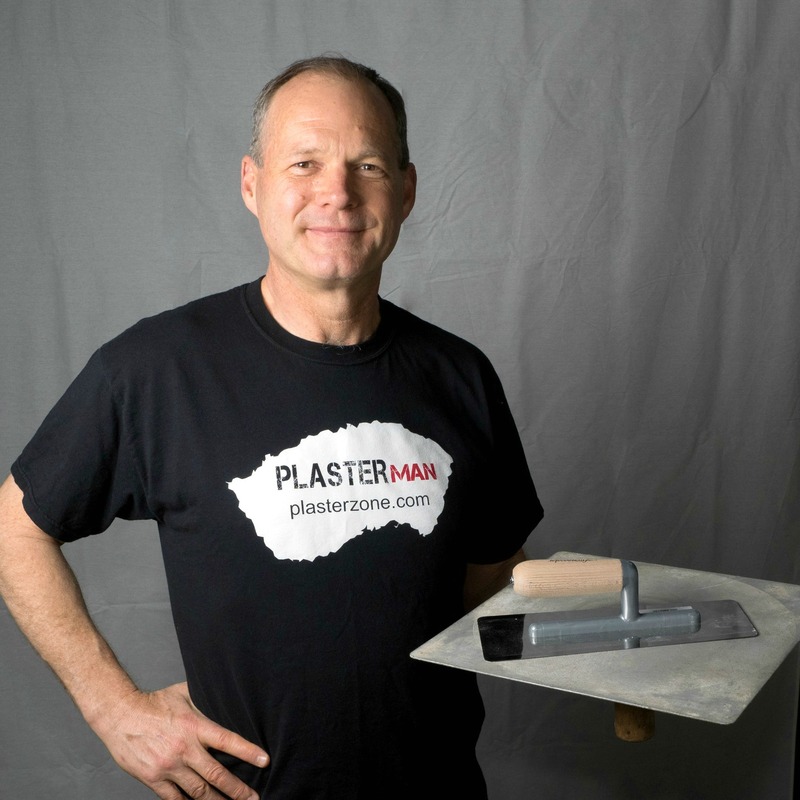 In 1995 I started appearing as Plaster Man at trade and home shows, putting on programs where I shared my knowledge with audiences across the U.S.. Then in 1999 I started writing a monthly column for Walls & Ceilings, an international trade magazine. And for five years I had my own weekly radio show. Soon thereafter I started producing 'how to' videos. More recently I have offered personal training to those interested in learning how to set up and run their own plaster repair business. Most recently I've turned my attention to filming more videos that I plan to put online soon. Of all the jobs and trades I've experienced, plastering is by far my favorite. I love doing the actual repairs and enjoy training others on how to do this type of work. Over the years my wife and three daughters have been involved with my repair business. My focus now is to share the knowledge I have of this great trade. There are so many facets of the trade, including full and veneer coat plastering, repair and resurfacing work, Venetian plastering, ornamental work, stucco and fantasy plastering. It seems that the varieties and methods are endless, with more being discovered and created with each passing year. I want to continue to learn all I can, and plan on sharing it all through this site. So be sure to sign up for my blog and stay in touch!